Oakland is entering a critical moment in the efforts to resolve OUSD’s budget crisis, and we urge the Board and district leaders to exercise the leadership and discipline it will take to right the ship and truly address the roots of the current budget problems. The outcomes of the next couple weeks cannot be more instability and more mid-year cuts while tinkering around the edges of broken systems. It goes without saying that cuts to schools sites should be avoided unless necessary to avoid state receivership. Already, school communities – particularly those serving working class neighborhoods with less access to private donations – are rationing copy paper, canceling field trips, and losing essential reading intervention specialists. Across Oakland, people are upset, and they have every right to be. Oakland’s students deserve a functional system that sends resources to school sites (which must be supported by an efficient, accountable central office) and invests in the best programs to serve them. Oakland’s educators deserve a system that provides the stability they need to do their critically important work. We must hold board and district leaders accountable for decisive actions this month. If OUSD loses local control for a second time in 15 years, Oaklanders should expect the state to be very aggressive in cutting spending. For example, state receivership likely means school closiures, and soon, with little time for community discussion. OUSD has more schools per student than comparable districts and a recent analysis identified this as a major problem. To have the same ratio of students per school as San Francisco, Oakland would have to close 18 schools; to have the same ratio as comparable California school districts, Oakland would have to close 30 schools (Education Resource Strategies). OUSD has no savings account. OUSD began this 2017-18 year with no savings (unable to meet the state minimum) and a significantly depleted self-insurance fund. State and county authorities are watching the board and OUSD staff’s leadership and decision-making right now. Any overspending could trigger authorities to call for state receivership. State of California: On September 13, Chris Learned, the State Trustee, testified to the OUSD school board about the possibility of state receivership, stating that, “If you can’t pay your bills that would tell me that you need to borrow money, in this case, with Oakland, it would happen before that. [If your multi-year forecasts show negative balances] that might be a time that I suggest to the state . . .[that it’s] time to come back into Oakland.” If it appears that OUSD won’t be able to pay its bills this year, the State Trustee might recommend action by the state to take control of OUSD. And there’s more. For this year, OUSD under-budgeted for Special Education and Food Services by $4.7 million. This wasn’t known until mid-September of this year. The direct problem is not a shrinking budget. 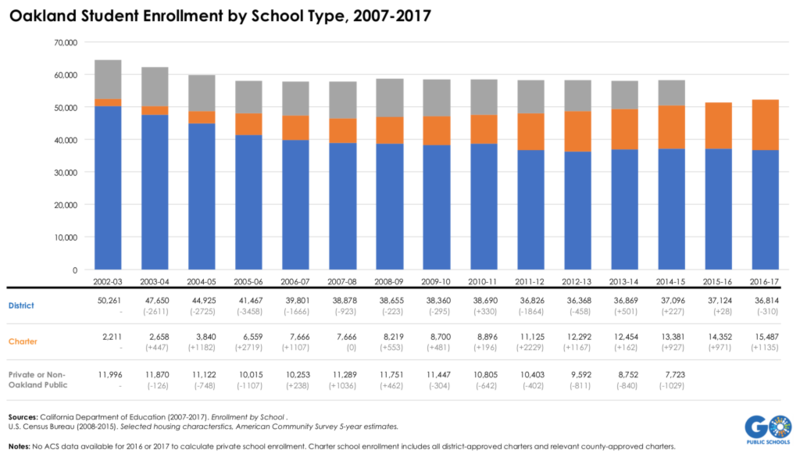 Though OUSD is faced with rising retirement and health care costs, its enrollment has been relatively flat for the past five years (actually up by 55 students) and they have had increased funding from both the state’s LCFF formula and through new parcel taxes (Measures N and G1). The problem is that without strong internal controls. OUSD has made decisions to spend without the corresponding cuts to keep its budget balanced. Additionally, OUSD will face flat state funding for the coming years and retirement costs will continue to rise. The Board’s November 8th resolution directed the Superintendent to make $15.1 million in mid-year adjustments based on the best information available at the time. The board established the $15.1 million target by balancing the negative impact of cuts against the risk of OUSD going into state receivership. State Mandated Reserve: $1.2 million to restore the reserve for economic uncertainty to the state mandated minimum of 2 percent. Contributions to Restricted Programs: $4.7 million to increase the District’s “general fund” contribution to three restricted programs — Special Education, Early Childhood Education, and the Cafeteria Fund — which have all run over budget for two years in a row. Self-Insurance Fund: $2.0 million to begin rebuilding OUSD’s self-insurance fund after the district borrowed (depleted) $8 million from it last year. As bad as the cuts feel right now, losing local control and being taken over by the state of California will be worse. And without significant mid-year adjustments, OUSD will likely go into state receivership. This means that we lose local control, our new Superintendent could get fired creating further instability, and the state will make decisions such as closing schools without engaging community. This is an issue of risk. OUSD can cut less, but will have a higher risk of going into receivership. While there are no right answers, some answers are riskier than others. If the Board chooses to lower the $15.1 million, that decision should only be based on new information such as (1) current revenue or spending projections being better than anticipated, (2) the level of cuts being deemed illegal, (3) a determination that cuts would be so devastating in terms of function that they would actually increase the risk of receivership. They have been working without a Chief Financial Officer for over a month and have other key vacancies, or people new to their positions. The actions of the past year showed some deeply problematic cultural issues within the organization (e.g., finger pointing, lack of cooperation, self-protection). Key financial controls have just been put into place and it takes weeks and months to see if they are working or not. Last year, for example, OUSD’s spending protocol and freezes were inconsistently complied with or enforced. Promised reforms have been delayed due to the intensity of the current budget crisis. What is GO’s Position on the mid-year 2017-18 budget adjustments? Avoiding state-receivership, minimizing cuts to schools directly impacting students, overhauling financial management and controls, and putting OUSD back on a path to invest in the programs our children need should be OUSD board and staff’s top priorities right now. Approve 2017-18 Mid-year Cuts: Make needed mid-year cuts to the 2017-18 budget as soon as possible to preserve local control (while minimizing impact to students, especially our most historically underserved students). If site-level cuts are necessary to avoid state receivership, then they should be minimized as much as possible. Our best understanding is that some site-level cuts are necessary because (1) the amount that needs to be adjusted is high; and (2) mid-year adjustments are harder to make because there are legal and contractual limitations (e.g., many contracts [for equipment/supplies and services] cannot be broken mid-year). We agree with the frustration and concern that school sites should never be put in a situation to be cut mid-year. Unfortunately, we understand that if the only other option is state receivership, then short-term cuts may be the better long-term answer. There are only so many areas of spending that can be stopped at this point. So, while central should be resized and re-aligned, and many aspects of how OUSD spends its money should change, most of those things cannot be changed this year in the next few weeks. They should be changed for next year. Promote Fiscal Stability for 2018-19: Engage schools sites and departments about further changes in the development of the 2018-19 budget starting again in January. Hire a Chief Financial Officer who is ready to truly change how OUSD budgets—see following recommendations for how. Re-align and resize central office to best serve kids and align to OUSD theory of action to support school site-based decision-making. Implement zero-based budgeting process with clear measures of how programs are impacting students. Zero-based budgeting means that instead of just rolling over a budget from year to year and assuming everything should stay the same, that you start from scratch and really ensure that the programs with the most impact on students are prioritized and others are phased out. (See, Government Finance Officers Association and Harvard Strategic Data Project). There are no easy answers to these problems. 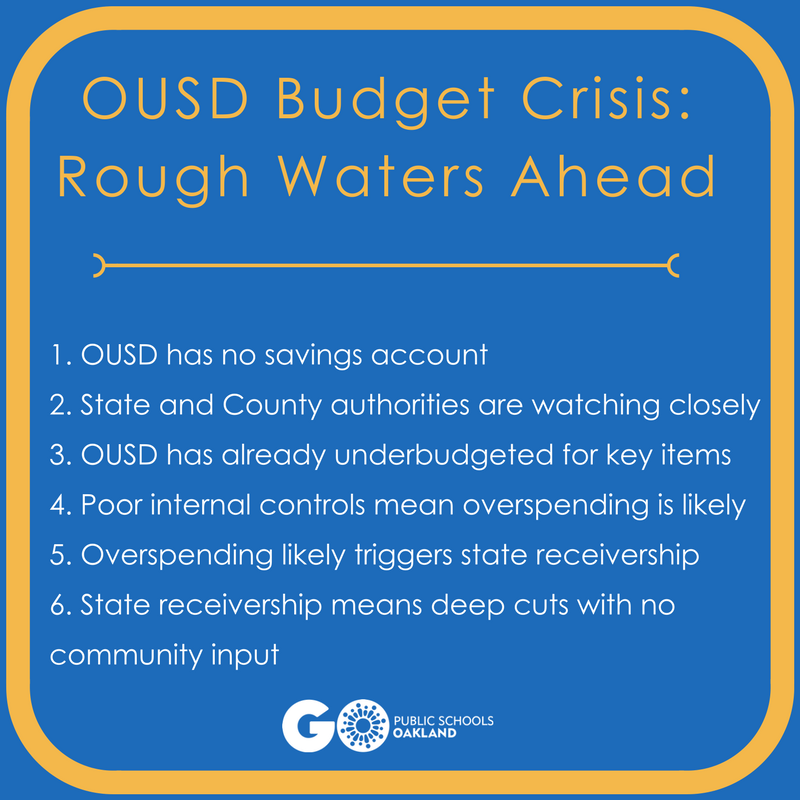 OUSD’s difficult decisions in the coming weeks need to happen to avoid worse outcomes, but this needs to be the last year of fiscal turmoil and mid-year cuts. We have a new, strong, local Superintendent in Dr. Kyla Johnson-Trammell and resolving this crisis is essential to supporting her tenure and leadership. OUSD leaders need to make the changes necessary to right the ship once and for all. That will take time, investment, leadership, and discipline. At GO, we will continue to gather, analyze, and share information and perspective to help all Oakland education stakeholders better understand where we are in this crisis, how we got here, our options for getting fiscally healthy again, and who is responsible. We welcome feedback, suggestions, and partnership to strengthen our analysis and perspective on the path forward.